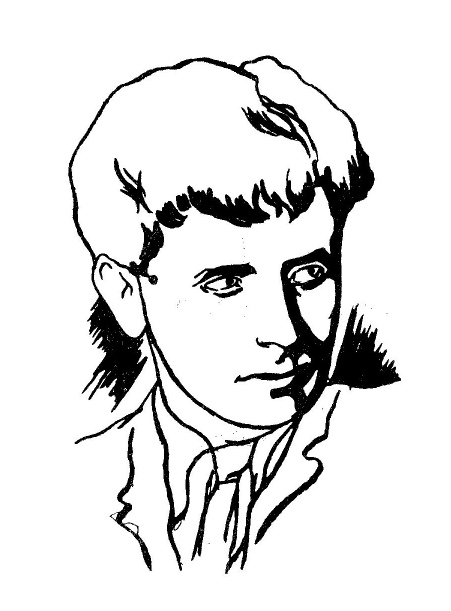 Markish’s book-length poem, “Der Fertsikyeriker Man” (The Forty-Year-Old Man), composed of 80 sections with precisely 12 couplets in each, underscores his modernist aesthetics and brash avant garde stylistic techniques. It is an enigmatic work, filled with astonishing, even grotesque, imagery. The poem’s focal point is an imagined Utopia following the dismantling of the Tsarist autocracy, though some of the sections primarily offer a critique of social ills and injustices in both Europe and America. Very little scholarship exists on “Der Fertsikyeriker Man.” Even A Captive of the Dawn, currently the definitive scholarly text on Peretz Markish and his oeuvre, offers no commentary, gloss, or discussion on this work. 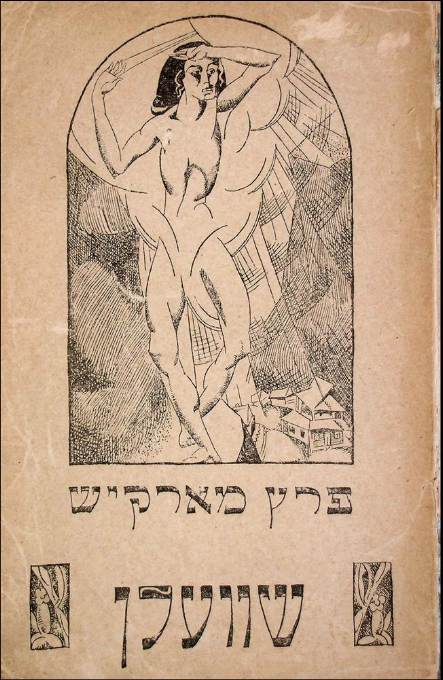 1 1A Captive of the Dawn: The Life and Work of Peretz Markish (1895-1952), Ed. Joseph Sherman, Gennady Estraikh, Jordan Finkin, and David Shneer (London: Legenda, 2011). This is a significant lacuna, especially when considering that in her chapter in this very book, Chana Kronfeld writes that many scholars regard “Der Fertsikyeriker Man” as Markish’s masterpiece. 2 2 Chana Kronfeld, “Murdered Modernisms: Peretz Markish and the Legacy of Soviet Yiddish Poetry”, in A Captive of the Dawn. Ibid. “Der Fertsikyeriker Man” has never been translated to English. Markish himself was afraid to publish it while he was alive and managed to smuggle it out of his house right before he was arrested. 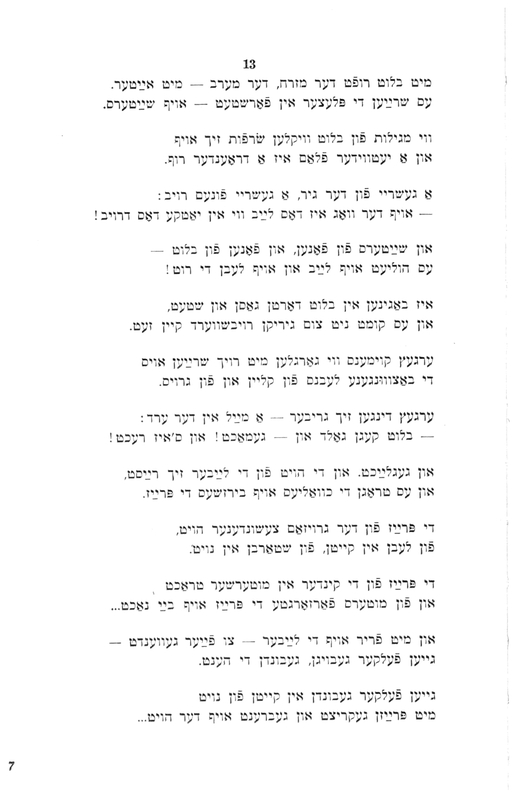 In 1978, his wife and sons published the Yiddish manuscript, and his son, David Markish, translated the poem to Russian. To read “The Forty-Year-Old Man” is to experience an exercise in contradictions: the style is at once radical and conventional, experimental yet contained. For example, Markish inverts linguistic norms, often by truncating words, so that they transmute into something new, something fabricated. Or the word remains recognizable, but its function within the sentence is transformed, so that a verb may turn abruptly into an adjective, or a noun into an adverb – though the same word may switch back to its regular function in the next line or section, creating a sort of inverted mirror effect. (Imagine the translator’s work!) All this is emblematic of Markish’s bold experimentalism. Yet one need only skim the pages of the poem to also notice its conservative bent. The poem is contained. Every section features the exact same number of lines, and most of the lines rhyme. Although the rhyme can be sloppy (the words refuse to be as contained as they’re meant to be), the meter is precise — the entire poem is in tetrameter. Daring as Markish may have been, he was still cognizant of the conventions of the artistic milieu of which he was a part. 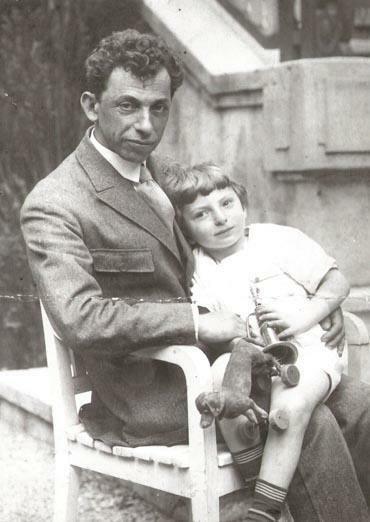 Writing in tetrameter, with perfectly spaced stanzas, placed him within the acceptable parameters of modernist Yiddish poetry of his time, which in turn allowed him the freedom of experimenting with words, syntax, and imagery. As a translator, one of the challenges I struggled with (and still am – the translation of this book is a work in progress) was how to handle the rhyme and meter. Keeping them felt restrictive to me, and—I thought—unnatural to the ears of the modern reader. Yet discarding them felt untrue to the poem’s music and, in a way, to Markish himself. At first, I tried keeping the rhyme, but I soon realized I was doing a disservice to the poem. The rhyming made the language sound contrived and not at all in keeping with Markish’s sensibilities. Furthermore, since Markish himself had been sloppy in his rhymes, I thought I might take more liberties with them myself. I decided, therefore, to abandon my efforts at rhyme and instead use other sonic devices, such as alliteration or assonance, to create the music in the poem. The meter, though, was more difficult to discard. It felt too deliberate on Markish’s part, and essential to the voice of the poem. And so, for the four sections presented here at least, I’ve tried to retain a four-pulse beat, similar to the original Yiddish. I selected these four sections out of the total of 80 because I liked the juxtaposition of a pair critiquing social ills (Sections 13 and 17) with a pair that seems to epitomize Markish’s utopian vision (Sections 36 and 37). In Section 37, especially, Markish’s romantic vision reaches new heights. He imagines a recreation of Russia not only as a political renewal, but also as a physical one. Like the anthropomorphic golem of legend, 3 3 Markish was interested in the golem motif. See Harriet Murav, “Peretz Markish in the 1930s: Socialist Construction and the Return of the Luftmensh” in A Captive of the Dawn for a wonderful discussion on this topic. See also my translation of Section 5 of Der Fertsikyeriker Man published in Circumference: Poetry in Translation, and my explanation of the phrase “an aleph in the mouth” in the introduction. earth becomes a live being. A new heart is being fashioned for it, and though “earth is still barefoot,” still in its infancy—though its people are still suffering birthing pains—“all’s fine and good.” After all, this is the beginning of good times. “From border to border,” a perfect country, a perfect world, awaits. blood against gold and – done! It’s a deal! 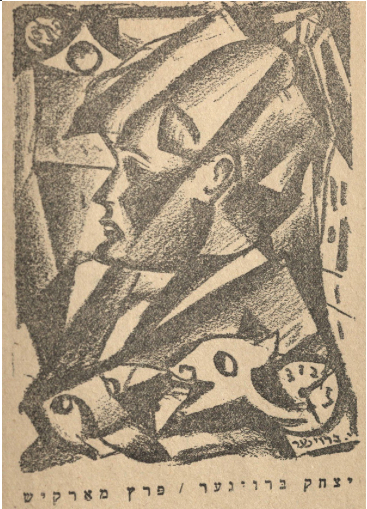 Portrait of Markish from the collection of his work, Yerushe: lider un poemes (Buenos Aires: Farlag IKUF, 1959). steps: May lightning from God strike them dead! She thinks: Oh, his cry! She thinks: Oh, his howl! someone takes out a cigar and smokes it. און זון ביז די קני, און זון איבער שוועל. און זון ביז די קני, און ביז האַרץ און געזאַנג. און מחנות נאָך מחנות אין פֿרייד קומען אָן. מע הערט ניט קיין פֿאָך און קיין פֿלאַטער פֿון פֿאָן. און אַלץ איז פֿאַרשטענדלעך און זוניק און קלאָר. און קיינעם געמיטן, און קיינעם געפֿעלט! און ס׳שטראָמט פֿון אים זאַפֿט, און ס׳שטראָמט פֿון אים העל. און ס׳ווילט אויף די הענט איצט זיך נעמען די וועלט. פּאַמעלעך זי נעמען, צוזאַמען, אין איינעם. – אָט דאָרט איז אַ וווּנד נאָך, אָט דאָ טוט נאָך וויי . . .
און ערגעץ נאָך טריפֿנדיק וווּנדפֿלייש פֿאַראַן. און ס׳שטעכט זי דער קראַנץ נאָך פֿון דערנערדיק דראָט. דאָך ווילט זי זיך נעמען אַזוי אויף די הענט. אָט דאָ איז אַ וווּנד נאָך, אָט דאָ טוט נאָך וויי . . .
all’s comprehensible, sunny and clear. איז באָרוועס, איז לאַפּטיעס, און גוט איז און ווויל. אַ האַרץ איר פֿאַר יעדן און אַלע באַשטעלט. און האָרנס פֿון שמידער אויף רעדער פֿון זאַמד. מיט וואָס וועט מען דינען און וואָס וועט מען טאָן? יאָדערדיק אײַזן ווי ברויט און – געניסט! צעשפּרייטן זיך טאָלן געברויטיקטער לאַנד. און ס׳שנײַדן זיך בלעטער פֿון אײַזן און שטאָל. אין שאַכטעס פֿון קוילן, אין קוואַלן פֿון נאַפֿט. און יעדערער וואַך איז און יעדערער טראָגט. צופֿוסנס –‬ די ימען, צוקאָפּנס – די זון. מיט שטאָלענע לונגען –‬ אַרויס און אַרײַן. נאָר איצט איז נאָך וווּנדיק, נאָר איצט איז נאָך וויי . . .
how will they serve, what will they do? hearty, robust iron, like bread – enjoy! only now wounded still, still hurt just for now. 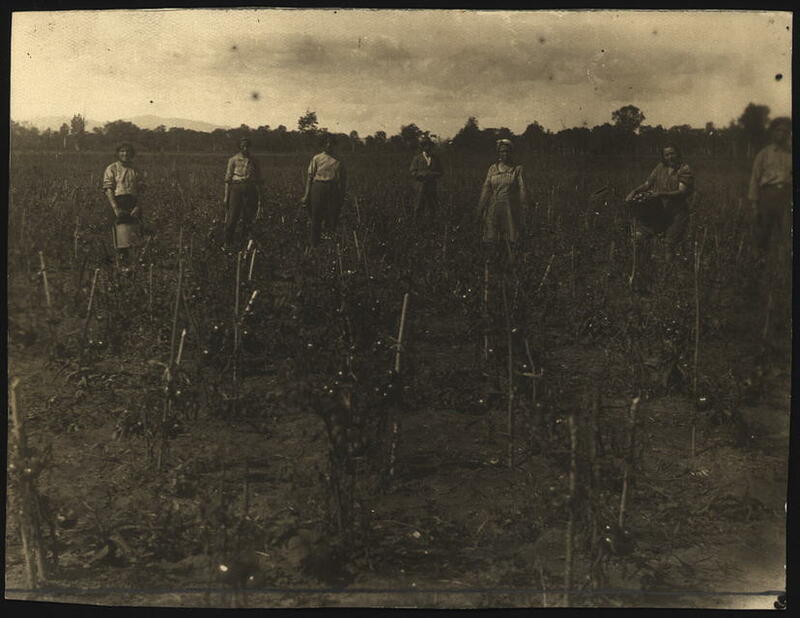 A Captive of the Dawn: The Life and Work of Peretz Markish (1895-1952), Ed. Joseph Sherman, Gennady Estraikh, Jordan Finkin, and David Shneer (London: Legenda, 2011). Chana Kronfeld, “Murdered Modernisms: Peretz Markish and the Legacy of Soviet Yiddish Poetry”, in A Captive of the Dawn. Ibid. Markish was interested in the golem motif. See Harriet Murav, “Peretz Markish in the 1930s: Socialist Construction and the Return of the Luftmensh” in A Captive of the Dawn for a wonderful discussion on this topic. See also my translation of Section 5 of Der Fertsikyeriker Man published in Circumference: Poetry in Translation, and my explanation of the phrase “an aleph in the mouth” in the introduction. Markish, Peretz . “The Forty-Year-Old Man.” In geveb, May 2016: Trans. Rose Waldman. https://ingeveb.org/texts-and-translations/the-forty-year-old-man. Markish, Peretz . “The Forty-Year-Old Man.” Translated by Rose Waldman. In geveb (May 2016): Accessed Apr 20, 2019. Rose Waldman holds an MFA in fiction and literary translation from Columbia University. She is a writer and translator.